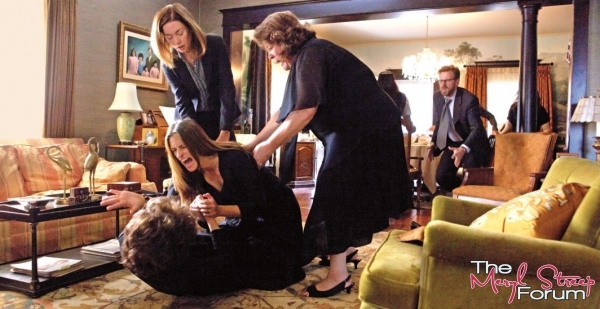 Word on the Streep: First production stills for "August: Osage County"
If it happens, that scene will be the reason. Dont u think its premature for predictions that Cate Blanchett is a lock for best actress. Shes brilliant in the film however its only August and nothing else has come out like Meryl, Judi Dench, Emma Thompson, and Kate Winslet. Yes, it's definitely premature to think anyone is a lock for a win right now. With how great Blanchett's reviews are, I'd be very surprised if she weren't nominated. The big kicker will be to see how critics react to A:OC, the film and Meryl's performance as a whole. She'll have to get amazing reviews for her to start to build some momentum. But it's helpful that her film is wide released at the end of the year, and of course, Harvey. Having just watched the UK trailer for "Diana" I am both sad for Naomi Watts and relieved that it doesn't look nearly as great as it should. I know it's just a trailer but she really doesn't capture her properly IMO. Given that this was without doubt the most baity role of the year it does put things back on the table. Even the BAFTA which I was convinced the patriotic Brits would hand her! It is far too early of course to tell what shape the season will take. I just find it ironic that two of the biggest Best Actress injustices in recent memory (Blanchett losing 98, Dench 97) are coming back to haunt us now. Had they won for the rightful role I don't think they would have such a powerful threat now. Yeah, the trailer to me looked like a sub-par made for TV movie. Totally agreed about Blanchett/Dench late 90's. Stupid Gwyneth Paltrow and Helen Hunt. SO lame. You hit the nail on the head with "Meryl is held to a higher standard." If she hadn't won for The Iron Lady, this would likely be DDL in Lincoln "undeniable." I think Daniel Day Lewis is also held to a higher standard mainly because he now has that reputation of immersing himself in character but Meryl herself is held to a much higher standard that ANYONE EVER. I think it may be in part so many of her nominated performances are iconic and since she didn't win for them for various reasons it just served to raise the bar and create higher expectations for next time. Related to that, do we think there may be a certain jealousy of her amongst her peers or mainly goodwill? If there's a pulitzer prize winning play to be adapted - Meryl. I couldn't care less about anyone else's career to be brutally honest so long as Meryl gets these parts but I do think there is a degree of bitterness when the Oscar ballot comes around. And I do understand it. If I was a really good actor but had a peer constantly heralded as "Better than anyone" I wouldn't be pleased either! Even if there is any sense of jealousy or bitterness amongst her peers, the vast majority of academy voters are not those who would be in direct competition for the same parts as Meryl. Those who came after her I feel tend to look up to her and even revere her. That group gets larger every year. Well, evidently, Meryl has agreed to go supporting rather than lead! She has that Oscar locked up.